Lincoln Rhyme is back... From the bestselling author of "The Bone Collector" and "The Devil's Teardrop" comes this spine-chilling new thriller that pits renowned criminalist Lincoln Rhyme against the ultimate opponent -- Amelia Sachs, his own brilliant protegee. A quadriplegic since a beam crushed his spinal cord years ago, Rhyme is desperate to improve his condition and goes to the University of North Carolina Medical Center for high-risk experimental surgery. But he and Sachs have hardly settled in when the local authorities come calling. In a twenty-four-hour period, the sleepy Southern outpost of Tanner's Corner has seen a local teen murdered and two young women abducted. And Rhyme and Sachs are the best chance to find the girls alive. The prime suspect is a strange teenaged truant known as the Insect Boy, so nicknamed for his disturbing obsession with bugs. Rhyme agrees to find the boy while awaiting his operation. Rhyme's unsurpassed analytical skills and stellar forensic experience, combined with Sachs's exceptional detective legwork, soon snare the perp. But even Rhyme can't anticipate that Sachs will disagree with his crime analysis and that her vehemence will put her in the swampland, harboring the very suspect whom Rhyme considers a ruthless killer. So ensues Rhyme's greatest challenge -- facing the criminalist whom he has taught everything he knows in a battle of wits, forensics, and intuition. And in this adversary, Rhyme also faces his best friend and soul mate. 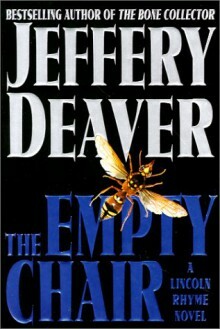 With the intricate forensic detail, breathtaking speed, and masterful plot twists that are signature Deaver, "The Empty Chair" is page-turning suspense of the highest order, destined to continueJeffery Deaver's bestselling track record and thrill his legions of fans worldwide.